With your own Domain Name comes endless possibilities. Start a community, become the next blogging sensation, create a travel company or online shop... The Internet is your canvas, try it today! Once you've used our Domain name lookup feature to scout out available Domain Names for your website, just click the green button to proceed with the simple process of cheap Domain registration. This Domain Search function will help you to find a Domain with the suffixes .com, .net and .tv, among some others. If you want to use a different TLD (Top Level Domain) such as .uk, .in, or .game, we highly recommend searching on GoDaddy, who will almost definitely have what you need. Enter your preferred Domain name without spaces, otherwise no results will appear. You can include synonyms, hyphens or numbers in your search, although we recommend first looking for your keyword(s) without any extras. Select this from the drop-down to use the tool as a Domain Name generator, which will suggest alternative available Domain Names as well as checking the availability of your specified preference. This can be useful if you are stuck for ideas and in need of inspiration - it might even find a better Domain than the one you thought of! Searching with this setting will enable you to buy URLs which are unregistered, but for some reason still receive visitors. This can potentially give your website a head start on the competition, as you will be receiving traffic from the moment you go online. This feature searches for Domain Names which will become available for registration within a few days. These are usually expired Domains, and can be sorted prior to searching by choosing an option from the second drop-down menu. Although you may prefer to get everything done and dusted today, buying a Domain Name with lots of incoming links can be good for SEO (Search Engine Optimization), which will lead to your website receiving more visitors. The Protocol and Subdomain are largely outside your control, but the Domain (green) is of utmost importance as it gives your site an identity. As you can see in the example above, webhostingsearch.com is the Domain of this website. Choosing a Domain matching the name of the website makes it easier for people to remember and find, and gives your site a valuable sense of professionalism. 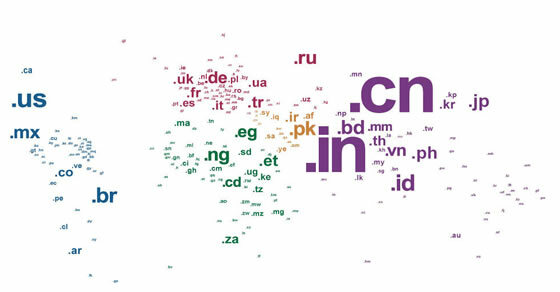 The most popular Top Level Domains (TLD) are .com and .net, therefore they are also the easiest to remember. The TLD you choose depends on your branding and what impression you intend to give - try a few out and see which one sounds right. As a general rule though, you can't really go wrong with a .com as it is highly recognizable and trusted by visitors and search engines alike. However, all countries have their own country code Top Level Domain (ccTLD) consisting of two letters, created and delegated by the IANA (Internet Assigned Numbers Authority). It is a good idea to get a ccTLD (even in addition to another TLD such as .com) in order to target local visitors - for example British people have more trust in URLs ending .uk. This will also make your website rank better in search engine results in your target country. ccTLDs are not always used in a conventional manner. Together with the right Domain Name some can form creatively phrased URLs. Armenia's .am is often used for AM radio stations, Italy's .it in domain hacks (for phrases ending with "it") and Tonga's .to for phrases ending with "to" - as well as being promoted as the TLD for Toronto. Additionally, the range of Generic Top Level Domains (gTLD) available is larger than ever before, giving you the option of ending your URL with descriptive suffixes such as .news, .markets, .academy among many more. Go direct to GoDaddy if you know you want one of these TLDs as opposed to the .com, .net and .tv TLDs offered here. The best and most memorable Domains are short, simple and unique. Find a Domain that contains relevant keywords (such as the name of your website or company), and avoids punctuation or numbers to reduce the chance of potential visitors confusing or misspelling it. To be successful in marketing in general, it's critical to develop a strong brand. Including your brand or company name in your site's Domain will be an invaluable contribution to this aim. Don't forget, you always have the option to register other, more generic domains later on and redirect them to your website. When just starting off though, stick to the brand. Nobody enjoys typing long, complicated URLs into their web browsers - keep your Domain name as short and simple as possible without losing meaning. Striking the right balance between simplicity and descriptiveness is the challenge here. On a similar note, avoid using hyphens and numbers. These may seem like a good idea if they allow you to get a variation of the Domain you want, but it will lack the memorability of a simple, well-chosen Domain name. Ideally, you will already have a list of keywords that relate to your website. Incorporating one or two of them into your Domain name lets people know, at a glance, what they can expect to find at your website. There are also serious potential benefits for the SEO for your site - URLs containing relevant keywords often rank much higher in search engine results. If potential visitors can't remember your URL, they may instead search for your website via a search engine. Although not disastrous, forcing visitors to find you in this way creates the possibility that they will arrive at a competitor's site. Don't try to ride on the coattails of another popular website by choosing a similar Domain name - it will do nothing except give your visitors a negative first impression. If you are completely out of ideas, try entering some keywords (without spaces) into the Domain Search tool above with Keyword Based Suggestions selected from the drop-down. This will enable you to use the search tool as a Domain Name Generator, and you can pick your favorite from there! You may also be interested in our article: 5 Mistakes to Avoid When Buying a Domain Name for the First Time. If you can't find the name you want here, it may have already been registered by someone else. In this case, you can search on WhoIs to find the owner and get in touch about the possibility of purchasing the Domain. However, it is not always possible to contact the Domain owner - they may have paid for private Domain registration thereby making their contact information inaccessible, or the information may be out of date. Fortunately in these cases, there are Domain marketplace websites where registered or soon-expiring Domain Names are bought and sold, both in auctions and at fixed prices. Domains bought at these sites are usually much more expensive than the options you will find here and at GoDaddy, so be sure you've tried plenty of different options before going down this route. Also, be sure to check your prospective Domain's history so you don't inadvertently inherit any search engine penalties. Founded in 2000, SnapNames are a very popular Domain registrar who list for sale over 30 million Domain Names every year. You can set up backorders to get a headstart on the competition, or use their Domain brokerage service to secure the rarest, premium Domains. Based in the USA, SEDO boasts over 2 million members worldwide, and provides a platform for trading Domains in over 20 languages. They offer the tools necessary to buy, sell, and monetize domains - including Domain appraisals and brokerage services. At the time of writing, SEDO's database contained over 18 million Domains. Typically, owning a Domain will cost you less than $10 per year. Sometimes, this figure is even lower if the Domain is not so popular, or if there are competitive offers from Domain sellers. Conversely, the price can also be higher in cases of highly attractive Domains. Buying a Domain that was previously registered is often more expensive, but it all depends on the Domain Name and TLD you want. My website isn't online yet, can I get a Domain from my hosting provider? Yes! In fact many of the excellent value for money plans on our Cheap Web Hosting page bundle the cost of a Domain into their price. This is the most convenient solution as you only need to deal with one company for both services. One that we recommend in particular is eHost, who are currently offering free Domain registration with selected Web Hosting plans, starting at only $2.75 per month! What happens if I decide I don't want my Domain any more? Usually, Domain registrations will renew continuously until you specify otherwise so in this case, you will need to notify your Domain registrar. Depending on their terms and conditions, you may need to notify them a set amount of time in advance. Do I need to use keywords in my Domain? No, it isn't compulsory to have keywords in your Domain, but it helps if you are yet to establish a brand. For example Amazon.com doesn't refer to shopping in any way, but they are so well-known that it no longer matters. It is also believed that Domains which incorporate relevant keywords rank more highly in search engine results, but even if it is the case, it is only one factor among many. With a strong enough brand and marketing strategy, any Domain name can be successful. 127 characters, to be precise. You can use characters A-Z. any numbers, and hyphens (although not at the beginning or end). It is advisable however to make your Domain Name as short and simple as possible while still conveying your site's purpose. Should I get my Domain Name evaluated? A Domain Name is only worth what you do with it, so we advise no. Just follow the basic advice given here and you will be able to choose an appropriate Domain with little trouble.